Sesame Roasted Carrot Summer Rolls | Naturally. I have meals that I turn to time and again- things I can do without a recipe, without much thought. Summer rolls are one of those items. I always have rice papers on hand and for the most part, have the rice noodles on hand too. I make a lot with raw vegetables (makes it super fast) but these roasted carrot summer rolls are lovely. Roasting carrots adds an extra layer of flavor and I’ve found with the soy sauce baked in, I don’t really need a sauce. 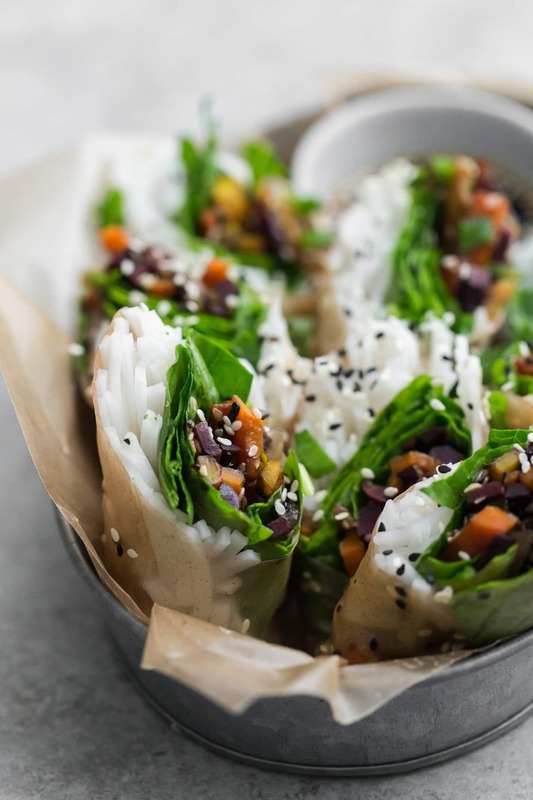 This makes these carrot summer rolls perfect for taking on the go. 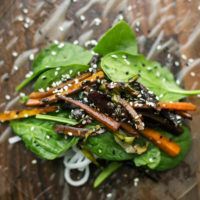 Roasted carrots shine in these vegetable packed summer rolls, complete with fresh baby spinach, soy-roasted carrots, and rice noodles. Slice carrots and green onions into matchstick sized pieces. Save the top part of the greens from the scallions for use in assembly. Place in a roasting pan and toss with tamari, honey, and sesame oil. Toss until well coated and add the sesame seeds. Roast, stirring occasionally, until carrots are tender and most the liquid is gone, 25 to 30 minutes. Cook brown rice noodles according to package. Drain some of the hot water into a dish that is big enough to fit the rice paper. Rinse the rice noodles under cold water and set aside. Set up your spring roll rolling station with the pan of water, carrot mixture, spinach, cooked noodles, toasted sesame seeds, and scallion greens. Add a bit of extra water if it is too hot- the temperature should be hot but not scalding. Soak the rice paper for 10-15 seconds, just until the rice paper starts to soften (this will depend on hot the water is). 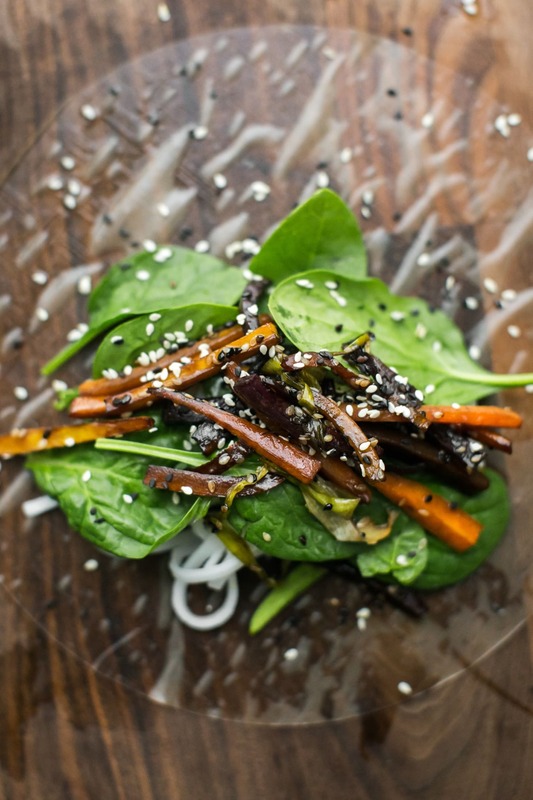 Place rice paper on a cutting board and load with rice noodles, spinach, carrot mixture, a sprinkle of sesame seeds, and minced scallion greens. Roll, tuck, and fold in sides as you go. Continue with remaining ingredients. Tips & Tricks: Make the rolls ahead of time and wrap in a damp towel or paper towel. Store in a sealed container in the refrigerator for a day or two. This recipe is two fold. 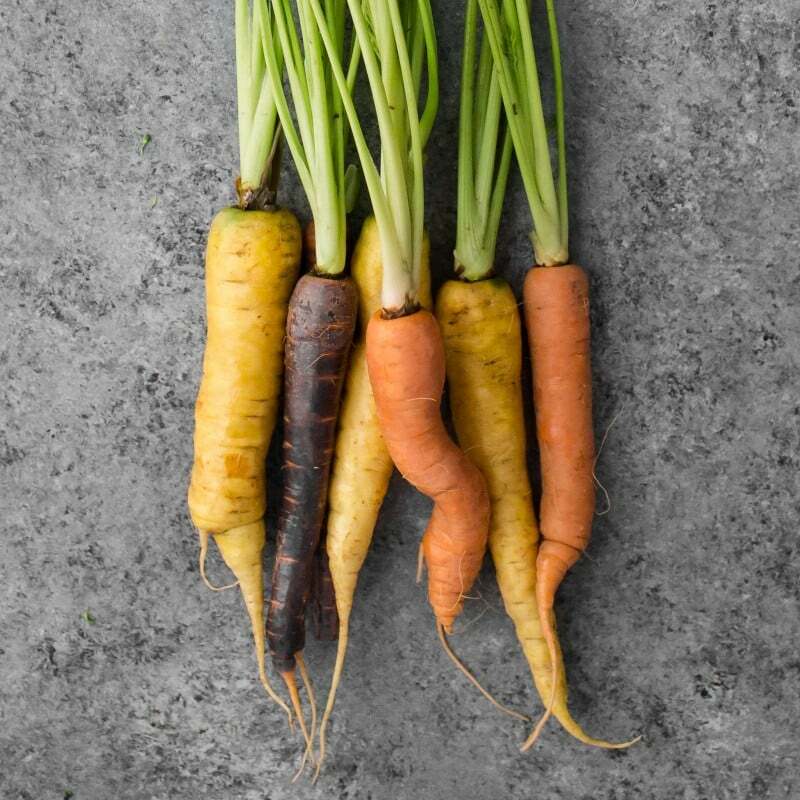 I use the carrots as a component for other recipes which means you could roast the carrots in a big batch and eat for two or three meals. Beyond that, I occasionally swap out the carrots for other in-season produce. I also leave out the rice noodles and boost the greens. Salad/Bowls: I love the carrot mixture by itself. The roasted carrots make a lovely addition to salads or top grain bowls. Make an extra batch of the carrots and use for lunch the next day. Tofu: Bulk up these carrot summer rolls with fried or bake tofu. Vegetables: Replace the carrots with sweet potatoes, parsnips, kohlrabi, or turnips. A mixture of vegetables could also be used. Carrots are the perfect transitional produce. They help to add a pop of color during the spring and fall months when produce starts to transition. 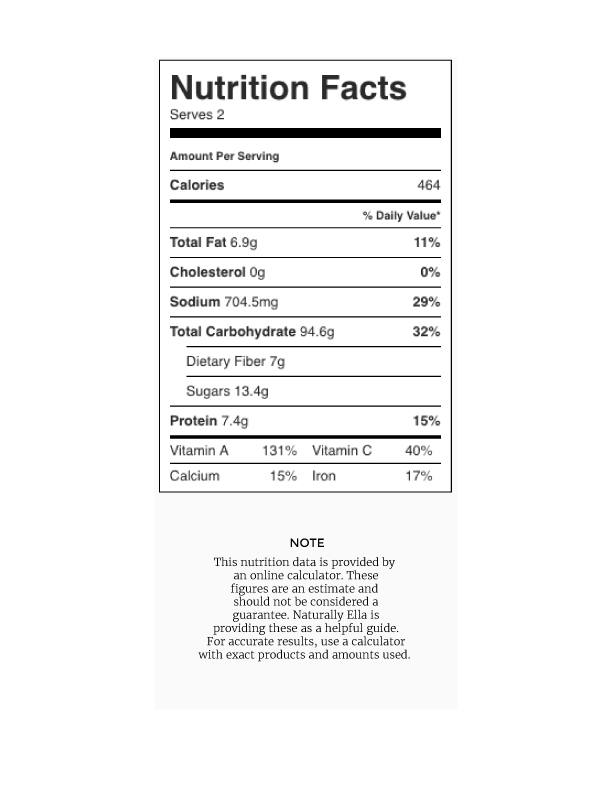 I love their slightly sweet flavor when paired with earthier ingredients. Also, I rarely peel carrots- just give them a good scrub! Lately I have started to try and incooporate sesame in some kind of style in lots of the things I cook because I really really love what it does to the taste ! So can’t wait to try this ? Yum. I found this recipe last night while looking for ideas on how to use up all of the random veggies in my crisper. I made the carrots tonight to mix into a quinoa bowl. So good. I can’t wait to buy the ingredients to make the full summer roll. These were a big hit with the fam last night, Erin. Thanks for the recipe!